One of Discover’s popular credit cards might not be in your wallet yet, but you’re likely considering adding one of their cards to your credit arsenal if you’re browsing this page! For good reason – Discover is known for their credit cards. In fact, they are the third largest provider of credit cards in the United States and they currently have nearly 50 million customers. That’s a lot of Discover cards! But Discover is also an online bank with other great savings, checking, and lending options. Headquartered in Riverwoods, Illinois, Discover has a number of different types of credit cards that will satisfy pretty much everyone – from travel rewards cards to cash back cards. No matter your personal financial and credit situation, you can likely find a Discover credit card that will work for you. We break down the benefits of popular Discover credit card options below, but in addition to the great individual benefits that we list, Discover offers some great benefits on all it’s cards. Those include things like FICO score monitoring and Discover Identity Alert. Identity Alerts are alert at no extra cost which you can access online that monitor your credit report, send you a notification when a new account is added on your credit report, and monitor risky websites that often reveal personal information like Social Security Numbers. Like cash? Who doesn’t! The Discover it Card is a great credit card if you’re in the market for a cash back card. They offer a whopping 5% cash back on certain purchases. The categories that qualify for the 5% cash back rotate each quarter and might be restaurants, gas stations, Amazon.com, or wholesale clubs. Don’t plan to spend money in the category that is part of that quarter’s bonus? No problem! You also get 1% cash back on all others purchases. While that might already sound too good to be true, they also offer to match your total cash back in the first year – doubling your rewards. Another great bonus of the Discover it Card is that they offer 14 months of 0% APR as an introductory rate on regular purchases and balance transfers after which the standard interest rates apply. The good news? That introductory 0% interest rate Includes balance transfers so long as they are posted to your account within about three months of opening it. After that, you will be charged a variable interest rate of between 11.99% and 23.99% on purchases and balance transfers. How much you will be charged will depend on your particular financial and credit situation. The interest rates on the Discover it Card is also variable and will change based on the prime rate. The card has a cash advance fee of $10 or 5% of the cash advance. There is also a balance transfer fee of 3% of the amount transferred. However, one of the benefits of the card is that there are no annual fees. The card is obviously a great deal – offering generous rewards and as a bonus double your rewards in the first year. Depending on where you buy things, you might be more likely to take advantage of the 5% cash back options. The fact that there is no annual fee is also a plus since many rewards cards that offer generous rewards also come with a hefty fee. Even the interest rate is within a very reasonable range, although if you have bad credit you might end up paying the higher part of that range which is a little more expensive. Also, it’s important to note that there are cash back cards out there that offer cash back percentages on every day purchases. Over time, you might be able to earn more cash back via those cards. Do you spend most of your money on gas and restaurants? If so, then you’re in luck since the Discover it Chrome Gas and Restaurant card gives you 2% back on your gas and restaurant purchases and 1% back on all other purchases. There is one catch – you can only earn this on $1,000 worth of purchases each quarter. That means you’re capped at earning a maximum of $20 per quarter or $80 per year from gas and restaurant purchases. You will still earn 1% cash back on all your purchases even after you max out your $1,000 of special purchases. After the end of your first year, however, Discover will match all the cash back that you’ve accumulated in the last 12 months and double your rewards. The good news is that you don’t have to pay an annual fee like with many other rewards credit cards, so you don’t have to worry whether or not you will earn back enough in rewards to cover your annual fee. Also, this card comes with an introductory 0% APR for the first 14 months on regular purchases and balance transfers. After that, it reverts to a relatively reasonable 11.99% to 23.99% variable APR. What you will pay though will be dependent on your personal credit and financial situation, as well as interest rates fluctuations. You will also have to pay a 3% balance transfer fee – but you’ll skip paying an annual fee. This card is recommended for those with excellent credit. Think this card might be the perfect one for you? If you spend a lot of money on restaurants and gas, it might be a better deal than the Discover it card because you’ll be guaranteed to earn extra cash back rewards on those two things which you buy every month versus the rotating slate of savings categories that you would get 5% cash back on with the Discover it card. The Chrome card is also a great option because it allows for cheap balance transfers. After paying the 3% fee, you don’t have to pay interest on your balance for the first 14 months after opening your account. This is a great deal in comparison to other card companies which either don’t offer introductory o% rates on balance transfers or which only offer them for much shorter periods of time. Cash back might be great – but a travel credit card also allows you to dream of the tropical vacation you could take if you saved up enough points. Discover it Miles travel credit card is a great card for those who are looking to earn travel points they can use to make their next dream trip a little more affordable. They give you 1.5 miles for every dollar you spend, and at the end of your first year, they will match all the miles you’ve earned. They also allow you to easily book travel with no blackout dates using your miles. 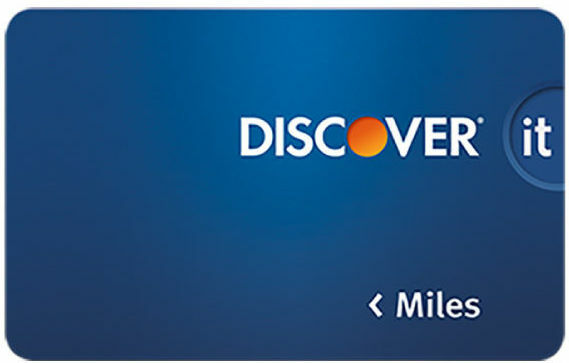 The Discover it Miles travel credit card offers 0% APR interest for 14 months after you open your account. Unfortunately, this doesn’t apply to balance transfers but they do offer a lower percentage of 10.99% on balance transfers within the first 14 months as long as they are completed within the first three months or so of opening your account. After that, the APR varies anywhere between 11.99% and 23.99%. How much you pay will depend on your personal credit and financial situation and fluctuations in interest rates. When it comes to cash advances, they charge 25.99% APR and a fee of 5% or $10 – whichever is higher. They also charge a 3% balance transfer fee on every transfer. There is no annual fee on this card. While there are some great benefits to the Discover it Travel card, whether it is the right card for you will depend on what you’re using it for. For example, if you want to transfer a balance to your card, you might be better off getting a card that offers an introductory 0% interest rate on balance transfers. But if you don’t plan on transferring a balance and you want to save travel miles so that you can buy a plane trip home for the holidays or for a summer adventure, then this could be the card for you. The question you might want to ask instead is if the first year bonus offered on the Miles card is as generous as sign up bonuses offered on other cards. Many cards from other credit card issuers give away 20,000 or even 50,000 in miles for signing up and spending a certain amount on your card within a specific number of months. Depending on how much you spend on your card in the first year, you might be better off with a different kind of sign-up bonus. Still writing mid-terms and hitting the books? If so, you’re likely in the market for a credit card to help you pay for the important things – like all the coffee you’ll need to stay up to study and get good grades. The Discover it Student card offers some benefits including no annual fee and 2% cash back on gas and restaurants and 1% cash back on everything else. At the end of your first year, they match your cash back rewards and double your cash! They also offer a unique reward for students. If you get a GPA of 3.0 or higher they will give you $20 cash back every year for up to 5 years after you take out your card. And you thought that good grades were their own reward! They also offer a 0% APR introductory rate for the first six months after opening your account. That does not include balance transfers, but the APR for transfer is a special introductory rate of 10.99% for the first six months. After that, standard interest rates apply which are variable and between 13.99% and 22.99%. The amount that you pay will depend on your personal financial and credit situation. They charge an interest rate of 25.99% for cash advances and a 3% balance transfer fee. This card is recommended for those with average credit or students who are building their credit. Sound like a good deal? That’s because it is. It can be very difficult for students to qualify for credit cards and even more difficult for them to qualify for a good rewards card. But this card gives you rewards without an annual fee. The special cash back for students is also a great bonus. Even the interest rate range is fairly reasonable – especially for a student who is likely still establishing their credit history and is likely to have to pay more anyways. If you intend to transfer a balance onto your credit card though, there might be better options that offer a 0% introductory rate – but as a student the trouble is that you might not be able to qualify for them. All in all, this is a great card option for students. Have bad credit? Or have you never had a credit card before in your life? It can be difficult to get a credit card company to take a chance on you if you’ve made mistakes in the past or if you don’t have any credit history. A lot of people turn to secured credit cards after they’re turned down for other cards because they’re great ways to access the power of a credit card and build your credit history and score. Essentially, a secured credit card requires that you put down a balance before you can borrow money. If you want a secured credit card with a $500 limit, then you have to put a $500 deposit on the card. You can then get the card and borrow and repay money just like you would any other type of credit card. Your responsible credit behavior is then reported to the credit bureaus and it builds your credit score. After a while, you’re able to apply for a non-secured credit card without a deposit and get approved, or ask your credit card issuer to upgrade your card to a normal credit card. It’s also an alternative to a prepaid debit card, which often comes with all sorts of costly fees and doesn’t build your credit score. But Discover’s secured credit card is special. Usually secured cards have no bells and whistles, but Discover’s offers no annual fee and 2% cash back at restaurants and gas stations on up to $1,000 each quarter and then 1% cash back on all other purchases. They also double your rewards at the end of your first year. The interest rate on the card is a variable 23.99% APR. They have an introductory rate on balance transfers of just 10.99% for the first 6 months. They also charge a balance transfer fee of 3% on each transfer. The Discover it Secured credit card is a great card – especially for those with bad or no credit. There are few options in secured credit cards that are as generous with rewards as the Discover it Secured credit card. The fact that they don’t charge an annual fee and they double your rewards after the first year is an additional great bonus. While the interest rate on the card is high, it’s actually relatively reasonable considering those who use this card are likely to have bad or no credit. It could be difficult for them to find a lower rate elsewhere. Do you spend all your winters either in your recliner waiting for the puck to drop or at the arena chowing down on beer and nachos while you watch the home team skate up and down the ice? Hockey isn’t just a sport – it’s a lifestyle. If you agree, then you might be interested in the NHL Discover it card. Similar to the Discover it Card, the NHL Discover it Card offers 1% cash back on all purchases and 5% back on special purchases in categories that change every quarter but include gas stations, restaurants, Amazon.com and other great options. However, in addition to the great benefits that you get with the Discover it card, you also get some benefits every hockey fan would love. 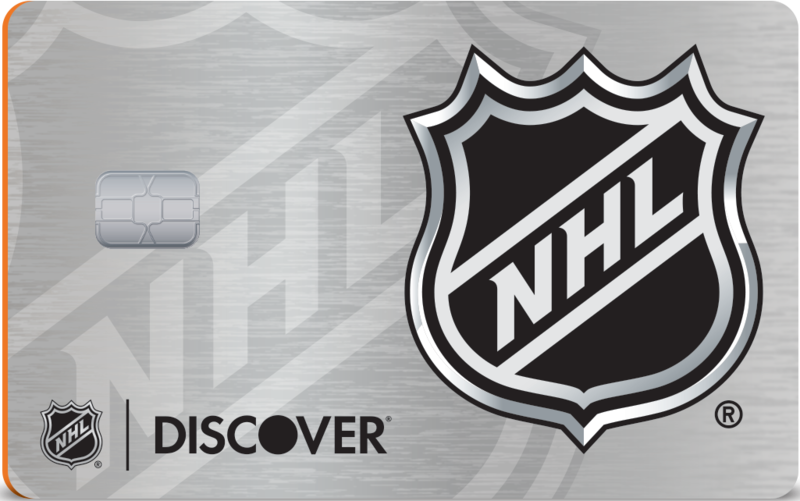 You get 10% off at the NHL online store and 10% off your NHL.TV subscription when you use your Discover card to pay. Sounds like a great deal! But the best part is, of course, that you get to show your team pride by getting your team on your credit card. Similar to the Discover it Card, you also get a 0% APR for the first 14 months on both balance transfers and other purchases and then you pay between 11.99% and 23.99% variable APR on both after that. In addition, they charge 3% on balance transfers. The card is recommended for those with excellent credit. Ultimately, if you like the NHL, or know someone who does, you might as well get the NHL Discover it card, rather than the regular Discover it Card since it offers the exact same benefits with the addition NHL discounts. The card is a great choice if you’re looking for a cash back card, however you might be able to find a card that offers more money back on regular purchases. Still, the 5% cash back offered on special categories is a great and attractive deal. When it comes to interest rates, whether it’s a good card for you will depend on what you’re able to qualify for. The Discover it Card for Students is a mash-up of the benefits and rewards that you get via the Discover it card and the Discover it Chrome Card for Students. Like the Discover it card, you get a rotating 5% cash back in different spending categories like restaurants, gas stations, and Amazon.com. These change each quarter. You also get a 1% cash back reward on everything else. Like all Discover cards, they double your rewards after the first year. Like the Chrome card, you also get $20 cash back if your GPA is above 3.0 each year for up to 5 years after you get your card. The Discover it Card for Students offers an introductory 0% APR for the first 6 months. After that, you pay between 13.99% and 22.99% in variable APR. How much you’ll pay will depend on your personal credit and financial situation and also interest rate fluctuations. However, because you are a student and you’re still building your credit, you are likely to pay on the higher end of that range. The card also offers an introductory balance transfer APR of 10.99% for six months so long as your transfer is posted to the account within a specific time period of usually around three months. They also charge a 3% balance transfer fee. The card is recommended for those who have average credit or no credit as it’s targeted towards students. It has no annual fee. Whether the card is right for you will depend on your individual situation. When it comes to the difference in rewards between the two student cards Discover offers – it really depends on your lifestyle. If you have a car and eat out often, you might be better off getting the Chrome card since it gives more cash back on gas and restaurant purchases. But many students take the bus and don’t have the cash to eat out, so they wouldn’t benefit from those rewards as much. They might be better off taking advantage of the potential for 5% cash back in rotating categories. Other than that, the offerings on this card are very similar to those on the Chrome card. The one downside of both cards are the potentially high interest rates. Unfortunately, a student might have a hard time qualifying for a lower rate. All in all, the student card is a great option.